Turning 60 is a milestone in your sister’s life. Finding the right gift to commemorate and celebrate the special occasion might be challenging since she might already have everything she wants. Start by looking at your sister’s hobbies and interests. 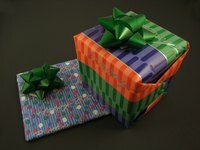 Determine how much you are willing to spend on the gift or if you want to make a gift. As her 60th birthday approaches, ask her for a wish list to get a sense of what she would like as a gift. Homemade birthday gifts require a little time to make, but may also be the most personal to give as a gift. A tied fleece blanket, scarf, hat or pillow, featuring a special print or theme that has a connection to your sister, is a functional, fun gift. Beaded jewelry is an option to make as well; using your sister’s birthstone colors and themed charms as a symbol of important things in her life can be a unique and personalized 60th birthday gift. Play on the number 60 by buying or making your sister 60 gifts that reflect her or her life. For example, ask 60 friends and family members to write a short letter sharing a memory of your sister and how she is important in their life. You could also put together a “60” bag that has 60 mementos symbolic of each year of her life. If you are looking to spend lavishly to commemorate your sister’s 60th birthday, host a party or dinner out in your sister’s honor and invite friends and family members. Consider sending her on a destination trip on or near her actual birth date, such as to an all-expenses-paid spa weekend or treat your sister to a hot air balloon ride over one of her favorite parks or sites. A specially commissioned piece of jewelry designed exclusively for your sister’s can give her a tangible memento of her 60th birthday. Do research online first for potential gift ideas for your sister to speed up the gift-buying process. A simple search with the keyword of a hobby or interest that is special to her can yield a variety of gift ideas to purchase within your price range. For example, search for gifts for a fitness buff and you might find ideas like a personal wellness monitor, customized duffel bags or a gift certificate to a gym. Consider whether you want your gift to symbolize or highlight the 60 years of her birthday, such as a "60 is nifty" T-shirt or mug. Using those ideas, decide whether to shop online or find a store near you that carries the gift item.